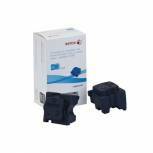 Xerox ColorQube 8570 Black Ink Stick 4.3K (Pack of 2) 108R00934 Pack of 1 Replacement solid inks for Xerox printers. Unique shape for fluid loading. Convenient cartridge free design. 2x sticks: Print up to 4,300 pages. Designed for ColorQube 8570 printers. Colour: Black. Xerox ColorQube 8870 Yellow Ink Stick 17K (Pack of 6) 108R00956 Pack of 1 Replacement solid inks for Xerox printers. Unique shape for fluid loading. Convenient cartridge-free design. 6x sticks: Print up to 17,000 pages. Fits ColorQube 8870 printers. Colour: Yellow. Xerox ColorQube 8870 Black Ink Stick 16K (Pack of 6) 108R00957 Pack of 1 Replacement solid inks for Xerox printers. Unique shape for fluid loading. Convenient cartridge-free design. 6x sticks: Print up to 16,000 pages. Fits ColorQube 8870 printers. Colour: Black. Xerox Colorqube 8870 Ink Stick Cyan (Pack of 6) 108R00955 108R00954 Pack of 1 Replacement solid inks for Xerox printers. Unique shape for fluid loading. Convenient cartridge-free design. 6x sticks: Print up to 17,300 pages. Fits ColorQube 8870 printers. Colour: Cyan. Xerox ColorQube 8870 Magenta Ink Stick (Pack of 6) 108R00955 Pack of 1 ColorQube ink stick for easy printing. Solid form of ink reduces waste and makes changing ink easy. Provides clear and clean printing. 6x sticks: print up to 17,300 pages. Fits ColorQube 8870 printers. Colour: Magenta. 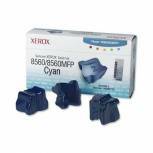 Xerox ColorQube 8700 Cyan Ink Stick (Pack of 2) 108R00995 Pack of 1 ColorQube ink stick for easy printing. Solid form of ink reduces waste and makes changing ink easy. Provides clear and clean printing. Pack of 2 sticks: Print up to 4,500 pages. Designed for ColorQube 8700. Colour: Cyan. Xerox ColorQube 8700 Magenta Ink Stick (Pack of 2) 108R00996 Pack of 1 ColorQube ink stick for easy printing. Solid form of ink reduces waste and makes changing ink easy. Provides clear and clean printing. Pack of 2 sticks: Print up to 4,500 pages. Designed for ColorQube 8700. Colour: Magenta. 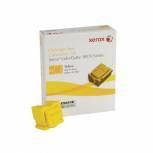 Xerox ColorQube 8700 Yellow Ink Stick (Pack of 2) 108R00997 Pack of 1 ColorQube ink stick for easy printing. Solid form of ink reduces waste and makes changing ink easy. Provides clear and clean printing. Pack of 2 sticks: Print up to 4,500 pages. Designed for ColorQube 8700. Colour: Yellow. 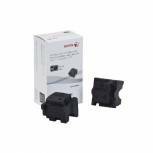 Xerox ColorQube 8700 Black Ink Stick (Pack of 2) 108R00998 Pack of 1 ColorQube ink stick for easy printing. Solid form of ink reduces waste and makes changing ink easy. Provides clear and clean printing. Pack of 2 sticks: Print up to 4,500 pages. Designed for ColorQube 8700. Colour: Black. Xerox ColorQube 8700 Black Ink Stick (Pack of 4) 108R00999 Pack of 1 Replacement solid inks for Xerox printers. Unique shape for fluid loading. Convenient cartridge-free design. Pack of 4 sticks: Print up to 9,000 pages. Designed for ColorQube 8700. Colour: Black. Xerox Phaser 8500/8550 Magenta Solid Ink Stick (Pack of 3) 108R00670 Pack of 1 Replacement solid inks for Xerox printers. Unique shape for fluid loading. Convenient cartridge-free design. Genuine Xerox product for unparalleled reliability. 3x sticks: Print up to 3,000 pages. For use with the Phaser 8500/8550. Colour: Magenta. 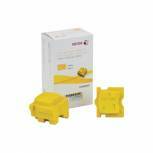 Xerox Phaser 8500/8550 Yellow Solid Ink Stick (Pack of 3) 108R00671 Pack of 1 Replacement solid inks for Xerox printers. Unique shape for fluid loading. Convenient cartridge-free design. Genuine Xerox product for unparalleled reliability. 3x sticks: print up to 3,000 pages. For use with the Phaser 8500/8550. Colour: Yellow. 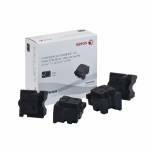 Xerox Phaser 8500/8550 Black Solid Ink Sticks (Pack of 6) 108R00672 Pack of 1 Replacement solid inks for Xerox printers. Unique shape for fluid loading. Convenient cartridge-free design. Genuine Xerox product for unparalleled reliability. 6x sticks: print up to 6,000 pages. For use with the Phaser 8500/8550. Colour: Black. Xerox Phaser 8200 Colorstix Yellow Pack of 2 016204300 Pack of 1 Xerox 016-2043-00 Colourstix 2 Yellow for use in Phaser 8200. Page yield 2,400. 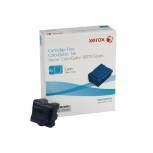 Xerox Phaser 8200 Black Colorstix (Pack of 10) 016204400 Pack of 1 Solid form of ink for the environmentally conscious. Reduces waste left over. Ensures the same results as traditional cartridges. Yield of approximately 14,000 pages in total. For use with the Xerox Phaser 8200. Supplied in a pack of 10. Colour: Black. Xerox Phaser 860 Colorstix 5X Yellow 2X Black 016190501 Pack of 1 Xerox 016-1905-01 5 Yellow Colorstix + 2 Black Colorstix for use in Phaser 860. Page yield 7,000. 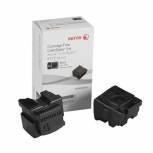 Q-Connect Xerox Phaser 8200 Waxstix Black Pack Of 5 016-2040-00 Pack of 1 Q-Connect Tektronix Phaser 8200 waxstix black. Q-8200-5B. 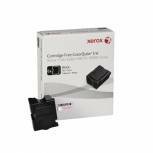 Q-Connect Xerox Phaser 8200 Waxstix Magenta Pack Of 5 016-2046-00 Pack of 1 Q-Connect Tektronix Phaser 8200 waxstix black. Q-8200-5M. 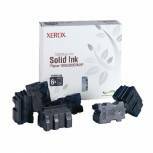 Xerox Black Phaser 8860/8860MFP Solid Ink Stick (Pack of 6) 108R00749 Pack of 1 Replacement solid inks for Xerox printers. Unique shape for fluid loading. Convenient cartridge-free design. Genuine Xerox product for unparalleled reliability. 6x sticks: print up to 14,000 pages. Designed for Phaser 8860 printers. Colour: Black. Xerox Phaser 8560 Cyan Solid Ink Stick (Pack of 3) 108R00723 Pack of 1 Xerox 108R00723 solid ink 8560MFP/8560 cyan (3 Sticks) for use with Phaser 8560MFP, Phaser 8560. Page yield 3,400.